We are the official dealer for New Holland, Case IH, Väderstad, Kuhn, Pöttinger, Manitou, McConnel, and Honda. We specialise in the supply and maintenance of market leading machinery for your agricultural business backed by knowledgeable and reliable service and support. Having served the agriculture community since 1832 we can confidently say the level of service, support and expertise we call the T H WHITE difference is working. Our sales process is born from our understanding that every machinery purchase is unique. Our manufacturer trained staff have years of expertise in specifying agricultural machinery making them best placed to create the solution that’s perfect for you. We begin with the fact find then carefully explore the best purchase route for you and clearly outline your choices regarding liability cover and servicing. Download our ‘Buying and Maintaining Agricultural Machinery’ brochure for full details. 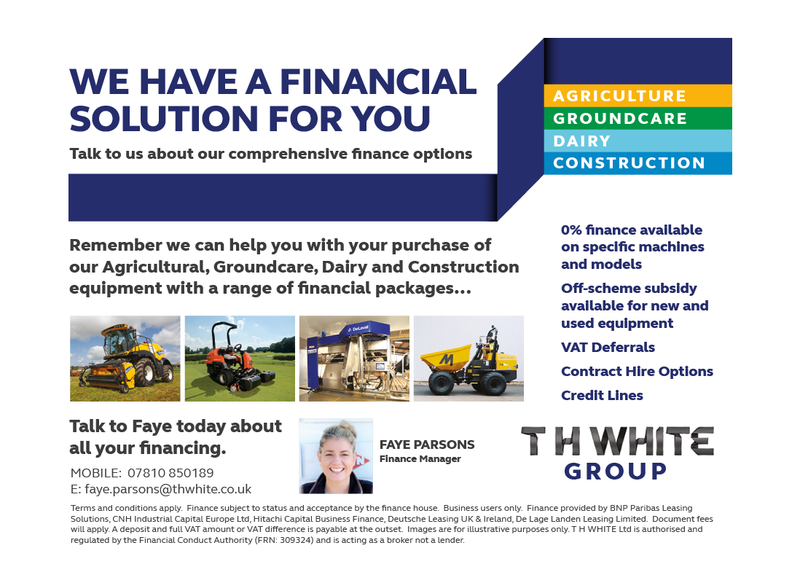 We also offer a range of comprehensive finance options to help with equipment purchases. Our dedicated aftersales team operates from branch and mobile workshops to service your equipment and support breakdowns. With an extensive range of parts and branch presence in 8 locations throughout the South West of England we are on hand to keep your farm running and growing. Operating in this field for almost 200 years, our experienced staff have the know-how to help you get the best from your machinery and look after it for generations. To find out more about our full range of new machinery or request a demonstration, speak to our sales professionals today.